According to the World Economic Forum’s Mining & Metals scenarios to 2030 report, “global population growth – together with upward trends in urbanization and industrialization, particularly in emerging economies – has led to a strong increase in demand for commodities from the mining and metals industries. This growth is highly likely to continue and will place pressure on the demand of resources”. While demand is expected to rise steadily, supply has not always kept pace. 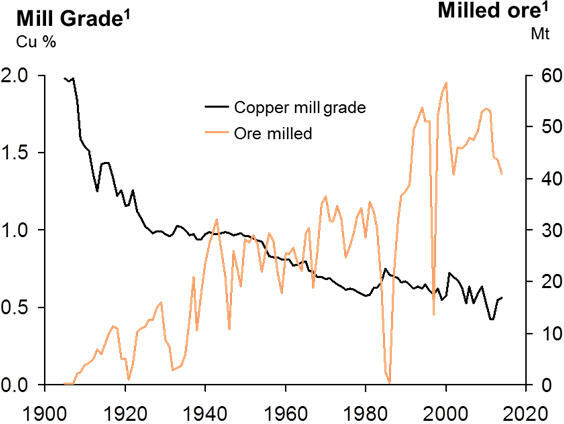 Grades of metals in ore of metallic deposits decreased significantly over the past decades (Figure 1). World class deposits discovery rates are falling and a growing number of new mines use higher-cost and technically challenging underground mining methods. Under these circumstances, mining companies are proactively seeking advanced technologies that could allow them to reduce costs and increase performance. Producers are also looking for ways to gain access to resources that at present are considered abandoned or uneconomic. Recycle the barren solution (with additional lixiviant) back to the heap. Figure 2. Simplified general HL scheme. Currently, HL technology is successfully used to extract gold, silver, copper, nickel, uranium, and even iodine. Due to abovementioned economic benefits, the number of HL operations has experienced an impressive and sustained growth over the last decades, with precious metal operations benefitting the most from the technology. The recent commodity market downturn has spurred further commissioning of new HL projects throughout the world (Figure 3). Figure 3. Start-up of currently operating major Heap Leach mines, # mines. Source: IntelligenceMine. HL operations are located in wide variety of geographical conditions, and succeed in all types of climate, from the Arctic Circle to the Tropics. According to the IntelligenceMine’s database, there are 235 active major HL operations worldwide, as well as 39 projects in development and 133 in evaluation phases (Figure 4). Figure 4. HL projects by status and commodity. Source: IntelligenceMine. Metal production from HL operations reached considerable proportions since their inception in the 1950s. 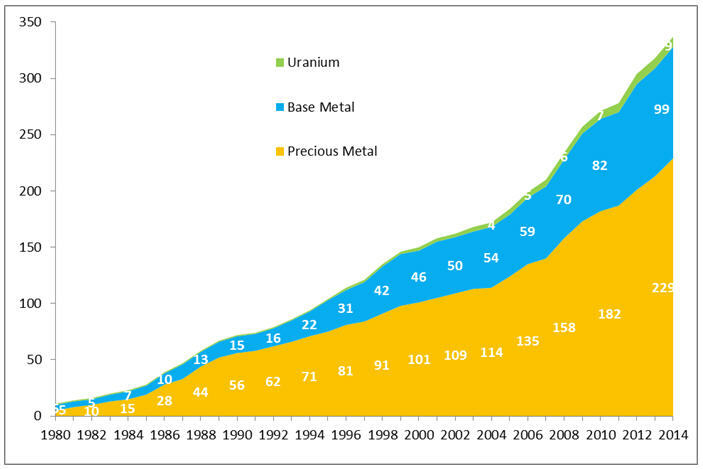 In 2014 about 150 major gold-silver mines worldwide utilized HL technology and recovered about 15 million troy ounces of gold, roughly 17% of global gold production (~89 million troy ounces, according to USGS data). With 970,000 troy ounces of gold recovered in 2014, Newmont/Buenaventura’s Yanacocha mine is the leader in HL of gold, followed by Barrick’s Veladero (722,000 troy ounces of gold) and Lagunas Norte (582,000 troy ounces of gold) operations (Table 1). Table 1. Top five HL gold facilities. *Source: IntelligenceMine’s ballpark estimation, based on available data. 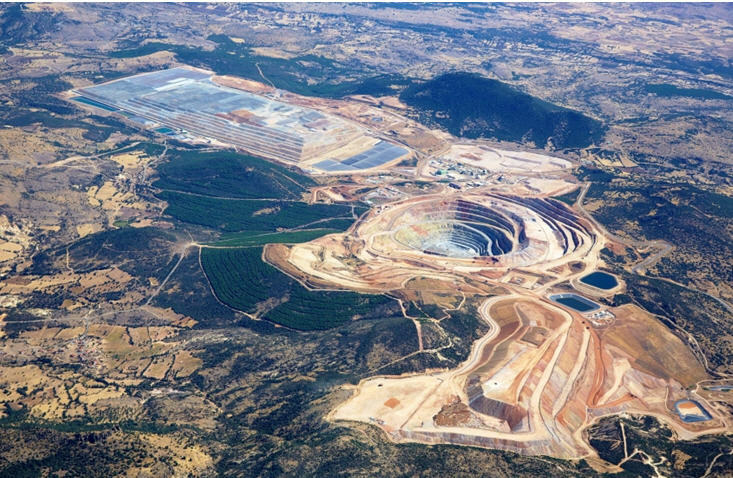 Aerial view of Kisladag mine, Turkey. Huge HL facility can be seen in the background. Source: Eldorado Gold. In 2014, more than 50 major HL-SX-EW operations worldwide recovered approx. 3 million tonnes of copper, which represents roughly 16% of total copper production. With about 327 kt produced in 2012, CODELCO’s Radomiro Tomic mine is believed to takes first place in terms of HL copper output, followed by BHP Billiton’s Escondida and Spence mines (Table 2). Table 2. Top five HL producers of copper. *Source: IntelligenceMine’s ballpark estimation, based on available data. 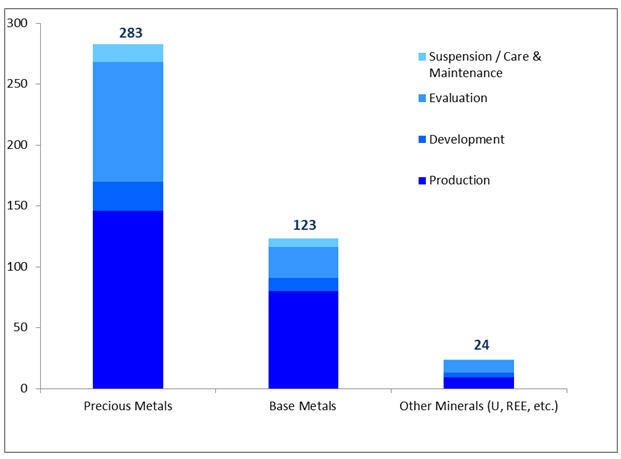 As can be seen in Table 2, the five biggest copper HL production facilities are located in Chile. There is no coincidence, since this is the region where the world’s biggest low-grade porphyry copper deposits are located. 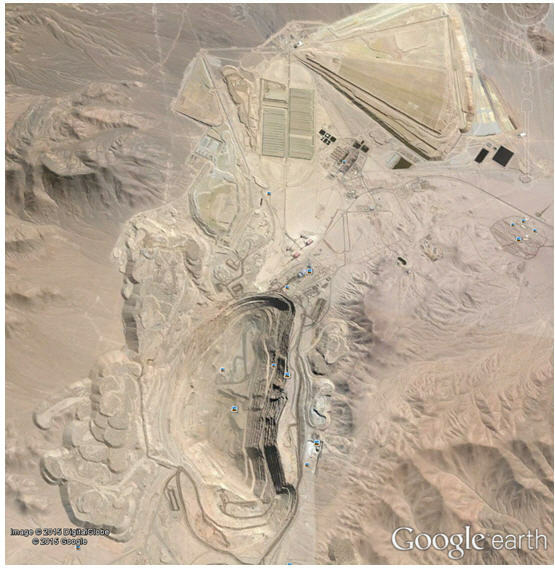 Satellite view of Radomiro Tomic copper mine, Chile. HL facilities are located north to the open-pit. Source: Google Earth. Since 2005, the following notable gold and copper HL operations have been commissioned: Veladero (Argentina), Lagunas Norte (Peru), Kisladag (Turkey), Los Filos (Mexico), Copler (Turkey), Porvenir (Mexico), Karma (Burkina Faso), Caserones (Chile), and many others. It is important to note that the mining industry has managed to implement a number of important advancements which allow producers to push HL boundaries to new more challenging environments. For example, there were new HL operations successfully commissioned in recent years throughout the world aimed to treat material accumulated in past decades in tailings and waste management facilities. Performance indicators shows stunning success of these kind of operations so far, with 62.4% EBITDA margin achieved at Kounrad HL waste “dumps” facility in Kazakhstan, and a cash cost of $4.29 /oz Ag at the Parral tailings HL project in Mexico. Kounrad HL facility, Kazakhstan. 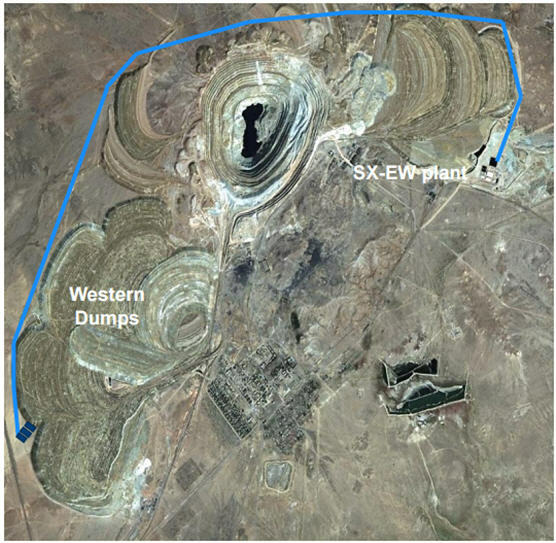 Old copper waste dumps and new HL-SX-EW plant can be seen. Source: Central Asia Metals Plc. HL technology has all the chances to succeed in the future, with plenty of opportunities, including HL application to extract massive amounts of precious and base metals sitting in abandoned tailings and waste management sites. Hopefully, recent developments will also allow the use HL to process primary sulfide ores. This would result in a dramatic expansion of the technology as ~80% of total ore types are sulfide in nature. Heap Leaching, at first sight, seems to be a relatively simple technology, but is in fact, quite a sophisticated process. Many disciplines and specialists have to be involved for HL to succeed, including mining engineers, geotechnical engineers, geologists, environmentalists, analytical specialists, processing chemists, metallurgists, hydrologists and other specialists. The upcoming Heap Leach Solutions – 2015 Conference to be held September 12-16, 2015 in Reno, Nevada, is a perfect opportunity for all interested stakeholders around HL technology to get together and discuss recent developments, insights and trends in HL.